In Greenwood, Eric and Christy Donnelly open a meat-focused cousin to their successful seafood-oriented RockCreek, and the neighborhood is thrilled. 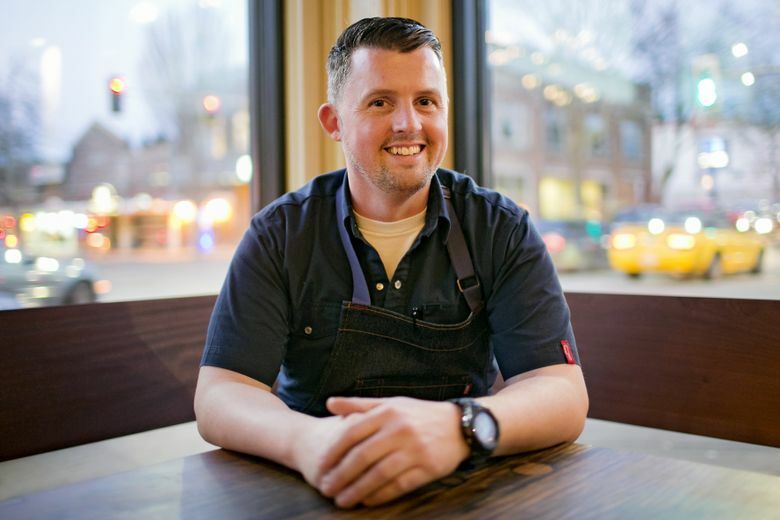 Once Eric and Christy Donnelly announced plans to launch a meaty cousin to their successful seafood-oriented restaurant RockCreek, anticipation for FlintCreek Cattle Co. built momentum like a mountain stream when the snow melts. Passers-by regularly peered through the picture windows wrapping the southwest corner of 85th and Greenwood and pestered the construction crew for opening information. 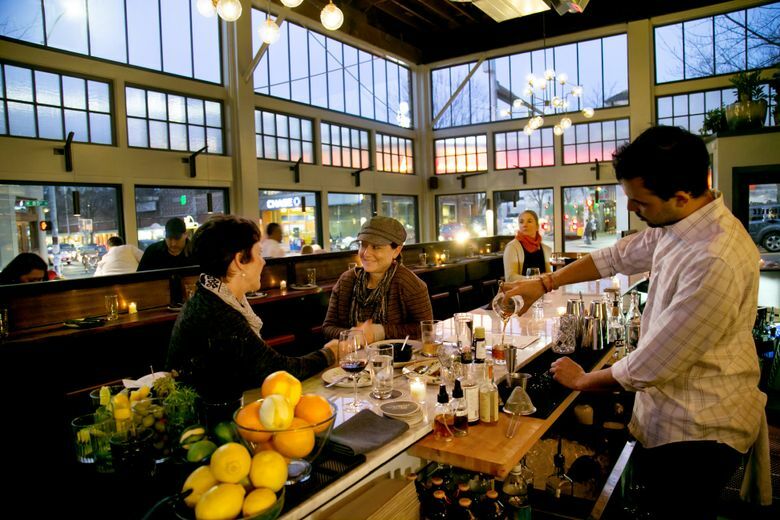 Sophisticated dine-in restaurants are fewer the farther you get from Seattle’s central neighborhoods. Increasingly North Enders want a nice meal without the I-5 aggravation. But even the Donnellys, who live in nearby Broadview, were surprised by the enthusiastic reception. “We went from zero to 90 right off the bat,” they said in a phone interview. They envisioned a soft opening, but there’s hardly been a lull in business since FlintCreek finally opened for dinner in late October, delayed by a gas-line explosion last March that decimated several adjacent businesses and disrupted construction on the restaurant. The blast blew out the top row of beautiful mullioned windows original to the 1910 building. New ones were installed that mimic them, above the row of originals remaining. The restaurant’s other striking element is a monolithic bar back made of Italian ceramic tile. You might ponder its dazzling effect while sipping La Bandera, a smoky, fruity mezcal cocktail, or the Coffinhead, a Rob Roy with a rye twist and the bitter intrigue of Punt a Mes. A counter runs parallel to the marble-topped bar, creating a corral of sorts for patrons. A counter seat affords a panoramic view of the main dining area and the open kitchen. Smooth concrete floors and no fabric other than denim napkins on the richly grained wood tables means there’s not much to quell the sound of people carousing. It’s slightly quieter on the mezzanine, where the raftered ceiling is lower and tables are more widely spaced; those next to the railing have an eagle’s eye view of the action below. The restaurant’s aesthetics are unfussy, but Donnelly’s style is to pile on. With a chef less skilled, plates might end up in a muddle, but his compositions aren’t scattershot, nor do they become tedious after a few bites. His instinct for how ingredients and flavor components complement and counterbalance each other is as true as a compass pointing north. Few would think to combine blue cheese and tahini, but it works fantastically well as a hummus-like dip for a distinctive assortment of pickled vegetables. 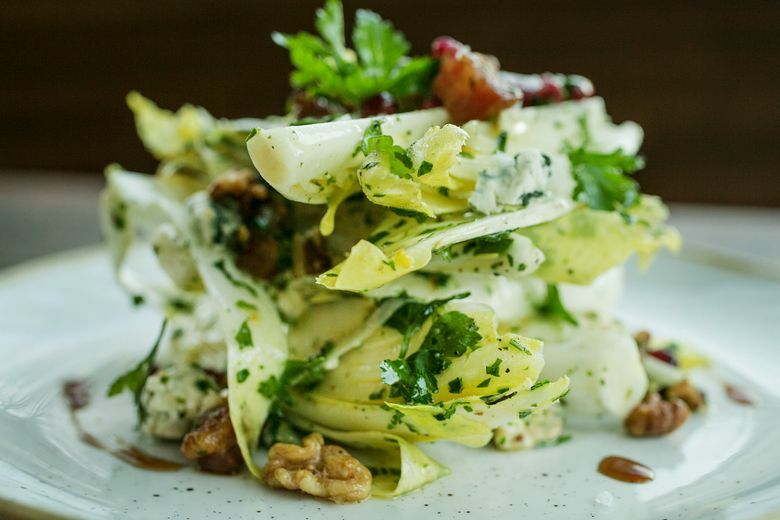 Blue cheese is often paired with Belgian endive, but here the vinaigrette-dressed stalks are cut lengthwise for heft and maximum crunch; crisp lardons, pomegranate seeds and walnuts further the appeal. Like RockCreek, FlintCreek is named for a real Montana stream, one that winds through several cattle ranches. The menu favors red meat — beef, bison, venison, wild boar and lamb — but seafood and poultry aren’t banished. If you order the big, blue-black local mussels — and you should — ask for extra grilled bread, or just spoon up the buttery broth. It’s vivid with lime and coriander; charred jalapeño lends a trace of smoke. Roasted red kuri squash, various wild mushrooms and silky sunchoke purée join spit-roasted chicken. The brined bird’s juicy flesh was deeply infused with fennel and sage; alas the reduced pan juices suffered from a surfeit of salt on my visit. Presumably though, meat is why you’re here and this kitchen does right by it, whether raw, roasted, braised or grilled. 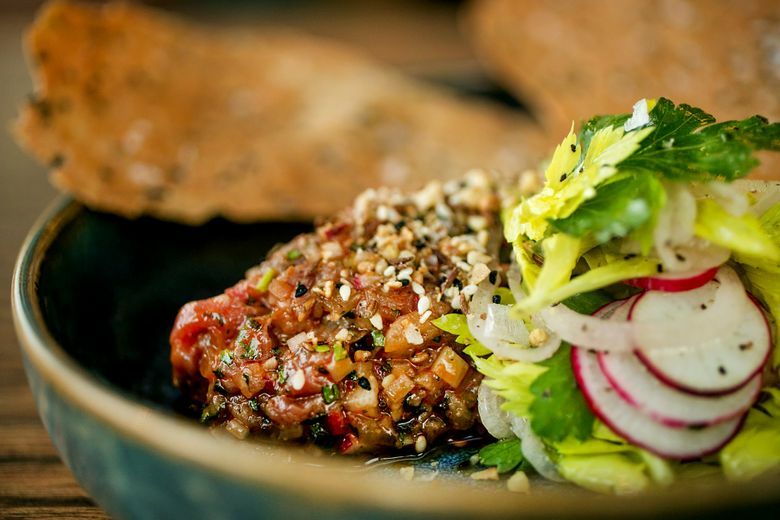 Dukkah spice gives the stunning lamb tartare a texture reminiscent of kibbe naya. Rose petal harissa, cured lemon and radish mix in with the coarsely chopped raw lamb, too, furthering the Middle Eastern connection. Herby, garlicky lamb sausage goes Alsatian. The skinny links are woven with roasted fingerling potatoes and truffled cabbage slaw into a nest that is set over raclette fonduta. Wedges of pickled green tomato assure all that richness doesn’t run amok. Wild boar braises overnight in wine and stock with fennel bulbs and red and green chile peppers. Sautéed parmesan-potato gnocchi is a fine match for such fragrant, yielding meat. Parmesan grits made a luxurious carpet for bison short ribs, recently replaced by bison osso buco. Both enjoy a wine-rich gravy smoothed with crème fraîche and the companionship of baby turnips and pickled mushrooms and onions. 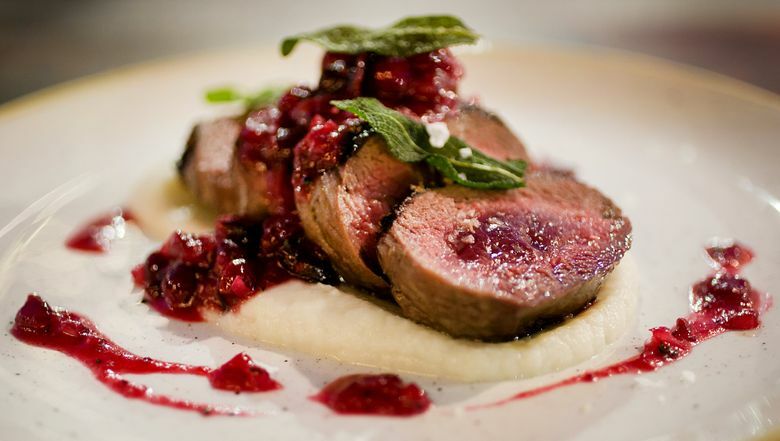 A classic huntsman’s sauce, a variation on Grand Veneur, dapples rosy slices of venison loin. (Donnelly does something similar with sturgeon at RockCreek.) The robust, brandy-spiked reduction features tart cranberries that play well against the faintly gamy meat and the sweet parsnip purée underneath it. Simpler tastes might look to chops — beef or bison — grilled over wood and served in solo splendor. A knob of Plugra butter seasoned with garlic, anchovy, lemon and cayenne melted into an admirably charred, medium-rare 12-ounce rib-eye (top-end choice, natural Angus beef from Montana’s Meyers Ranch, $42). Among the a la carte sides are pommes Dauphinoise, Romesco-sauced roasted cauliflower, za’atar-spiced grilled carrots and molasses-sweetened mustard greens that needed a bigger dose of vinegar. If you happen to have some Mark Ryan “Vincent” red wine left in your glass at the end of the meal, it goes well with a cheese plate composed of buttery, soft-ripened St. Simeon, medjool date mostarda and nigella seed crackers. The piling on doesn’t stop at dessert. The banana split is an avalanche of goodies: brûléed fruit, dense brownie, Amarena cherries, candied pecans, vanilla ice cream studded with chocolate-covered peanuts, and oh-why-not — caramel sauce. Sometimes too much is just enough.